Baystate Dental Sturbridge Invisalign Day! Free Invisalign Consultation & Up To $1,800 Off Treatment! 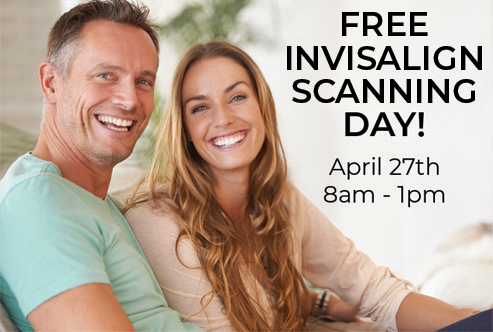 Baystate Dental of Sturbridge is excited to invite you to our Invisalign Day on Saturday, April 27th from 8:00 AM – 1:00 PM at our office, located at 110 Charlton Road, Suite 25 in The Center at Hobbs Brook. Drs. Matthew Haluch and Gary Circosta will be providing FREE consultations to answer your questions about Invisalign treatment, the clear way to straighten teeth. If you have ever wondered if Invisalign treatment is right for you, schedule an appointment for this special event and treat yourself this holiday season. Limited spots are available for this event. We accept most types of dental insurance and have financing plans available - including 0% interest rate plans for those who qualify through CareCredit financing. No Insurance? No Worries! Call (774) 282-4144 today to see what discounts are available. Invisalign® Day and associated promotions are hosted and sponsored by Dr. Matthew Haluch and Dr. Gary Circosta at Baystate Dental and not by Align Technology, Inc. *Must mention offer to receive free consultation and discount. Discount may vary based on length of treatment. Offer may not be combined with any other offer, discount, insurance, or reduced-fee program. Full value $6,194. ADA 9310, 8090. Offer expires 60 days after receipt. Matthew Haluch, DDS & Associates.